Your financial future depends a lot on the planning you do now. Use the assessment checklist to help determine the current financial heath of your organization. Then use the additional tools to create a solid financial plan and move ahead with sensible investing. Discover how financially minded people can be an asset to your ministry. Then read through a stewardship article which can help your church discover whether or not investing is a biblically sound concept for your church to participate in. Now’s the time to get ready for what’s ahead. Is Your Financial Future Secure? Use this checklist to find out. Several principles can take the uncertainty out of church finances. How bond financing could hold the key to your ministry’s future. 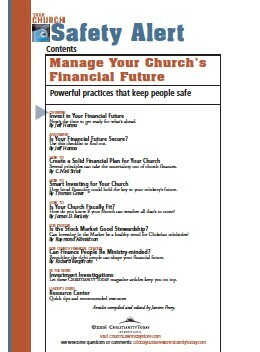 Is Your Church Fiscally Fit? How do you know if your church can weather all that’s to come? Is the Stock Market Good Stewardship? Is investing in the Markey a healthy trend for Christian ministries? Can Finance People Be Ministry Minded? Recruiting the right people can shape your financial future. Let these CT magazine articles keep you on top of investment information.